I have decided that "24" is the Best. Show. On. Television. Thank goodness for my DVR (for many, many reasons, but that's a post for another day). As I was watching THE show of the season last night (yes, I'm a little behind- but did you read the part about my DVR), I realized that it didn't make sense for me to be so excited about a television show. And then I realized, I just. Don't. Care. I love this show! 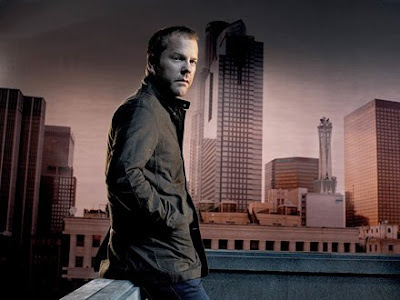 Jack Bauer is my hero! Anyone else watch this show? Are you as obsessed as me? I saw him first!!!! His picture is up on one of my post from last week. I LUV me some Kiefer!!! I. Do. Not. Miss. This. Show. BTW - Your new photo is adorable!!! No I did not just lick my computer screen! MY OWN MOTHER WILL NOT SPEAK TO ME DURING "24"- I'm in Ohio, she's in Florida. I don't care if my world was crashing down around me, she'd say "Call me in an hour." Oh my.. It's been awhile!